Actors Chris Hemsworth (“Thor”) is Captain Mitch Nelson and Oscar nominee Michael Shannon (“Revolutionary Road” and “Nocturnal Animals”) is Hal Spencer lead the charge of a group of soldiers who’s acts of heroism highlight what “12 Strong” is about. 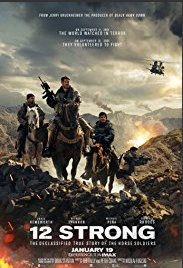 Based on the best-selling book Horse Soldiers, “12 Strong” is a powerful war drama that highlights the true events that unfold in the aftermath of 9/11. Awesome story of sacrifice and bravery. “12 Strong” tells a sharp, heroic story. These men just go and get it done. “12 Strong” is one of the better war movies that has opened in recent years. “12 Strong” is worth a look. “Oh What a Tangled Web We Weave When We are Trying to Deceive.” That about sums up “A Den of Thieves”. With the exception of a few dead spots the movie is entertaining, full of suspense, action and intrigue. There are a few surprise twists and turns also. The paid critics were “Luke-Warm” about “Den of Thieves”, but I thought it was pretty good. It’s an enjoyable “Heist Drama”. 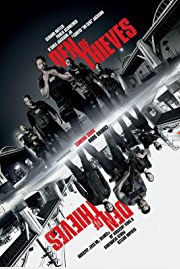 If you enjoyed the 1995 movie “Heat”, I say throw caution to the wind and check out “Den of Thieves”. 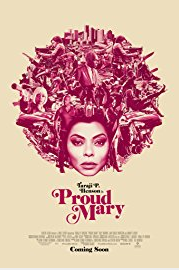 I had high hopes for “Proud Mary” I believe it’s going to be a Franchise for Taraji P. Henson. She deserves better because if this is the first installment there is nowhere to go, but up. “Proud Mary” does not set the stage or provide any foundation for the story so that you will understand the character. I find Taraji P. Henson’s talent wasted on this vehicle. She deserves better. The movie is choppy and lacks depth. The end is abrupt and does not close any open gaps. “The Commuter” would be an awesome action-packed thriller if the story made sense and provided a foundation from the beginning, but it doesn’t do either of those things. You the viewer have to piece the story together yourself, it’s not an easy task. I love Liam Neeson, but not in “The Commuter”. He does what he can with what he was given, but yet it’s not enough! The context of the story does not make sense. You are not given enough to fully understand the “What’s and the Why’s”. It does come together at the end, but at the end it’s too late!! There are several excellent movies currently playing. “The Commuter” is worth a look, but only as a last resort. Plain and Simple…Meryl Streep portrayal of the first ever female publisher of an American Newspaper was Brilliant!! “The Post” gives you “Old School” reporting and reminds you of times long since passed where Newspaper Reporters pound the pavement to get the scoop. The story moves along quickly and shows an accurate account of the events that occurred. 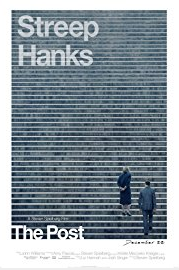 “The Post” is an excellent collaboration between Spielberg, Streep and Hanks. Finally!! I was able to see “Darkest Hour” this movie has been on my “Watch List” for months!! I was highly disappointed when it opened Nov 22nd in limited-release and it did not open in a theater near me until Christmas Day. 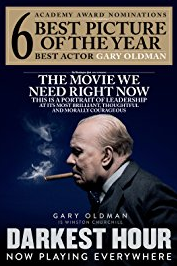 Gary Oldman is brilliant as Winston Churchill. He deserves every award nod he is currently getting. While at times a bit dull, the movie is still moving, entertaining and educational. I am not sure why it took so long to go wide-release, but at least it finally did.